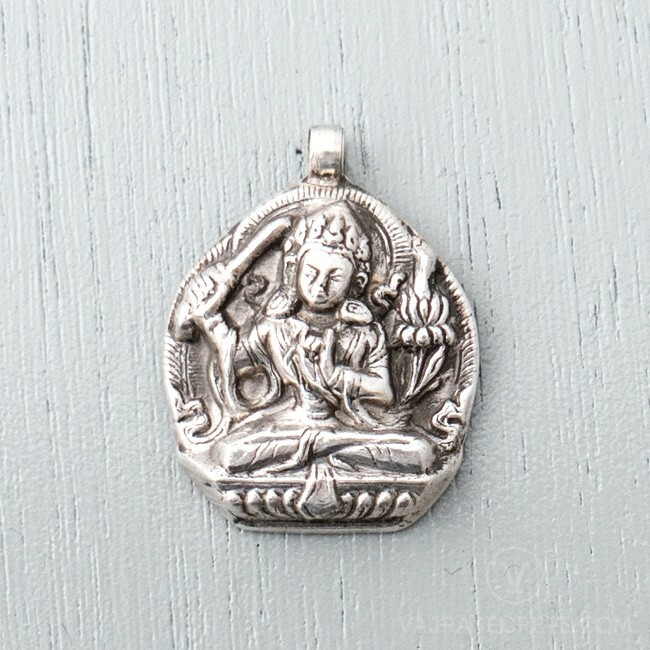 Handcrafted by master Himalayan silversmiths, this sterling silver Manjushri pendant is highly recommended for anyone who loves all things simple and rustic. With this Buddha of Wisdom by your side, understanding, improved memory, better communication skills, and the development of your mind are just a step away. Bring Manjushri's wisdom and blessings everywhere you go with this sterling silver pendant handcrafted by master Himalayan silversmiths. Highly recommended for anyone who loves all things simple and rustic, and can be paired with a silver chain, leather cord or even a blessed Protector String for additional protection. Images of Manjushri are commonly found in libraries and study rooms in monasteries. Keeping his image will be very beneficial for students, for those in the education and communication industries, for young children, and for anyone who seeks greater wisdom. With him close to you, understanding, improved memory, better communication skills, and the development of your mind are just a step away.